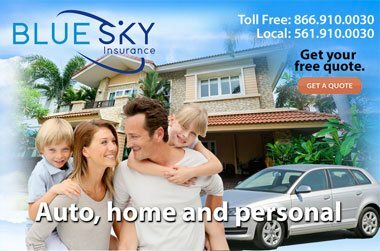 Auto insurance in Boca Raton. representing over 70 insurance companies. Florida car /auto insurance quotes and policies in Boca Raton for personal vehicles. Choose reliable coverage from a variety of carriers and get the lowest rates available. 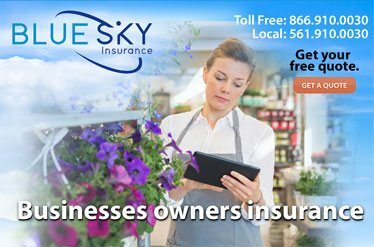 Blue Sky Insurance in Boca Raton provides auto / car insurance for Florida vehicles. 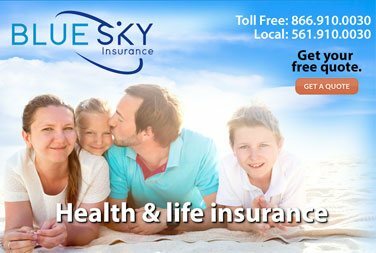 Choose from over 70 insurance carriers for the lowest rates and best coverage. Annual premiums can be calculated using our Florida auto insurance calculator or you can contact our office with your vehicle and driver information to get quotes on your policy. Before hitting the road, you need Florida auto insurance. Most, if not all, drivers can’t drive without having some type of auto insurance policy covering themselves and their vehicle. There are serious liability issues that come with operating a motor vehicle in Florida. The risk factor goes up dramatically vehicle incidents and that is why you need to carefully consider the best protection for your Florida car insurance policy. Here are the types of car insurance policies you can buy to cover different things such as liabilities to property, individuals and your car. • Medical Payment Coverage - Covers medical bills in the event of an accident. • Uninsured Motorist Coverage - Protects yourself when the other driver doesn't have adequate coverage. • Collision insurance - Insurance that protects yourself in a collision when the other driver has no insurance or the accident is your fault. • Extended Personal Injury Protection - When medical bills exceed $10,000 or you have lost wages you are covered to the amount of protection you buy. • GAP insurance - When your car is worth less than your loan amount you will be able to pay off that loan. • Extended Personal Injury Protection - Protects you from loss wages or medical bills that exceed $10,000. • Bodily Injury Liability Protection - When medical bills go into the tens or hundreds of thousands from an accident you caused. • Rental Car coverage - When your car is being repaired you can be covered for your rental car expenses. The potential consequences can be significant if you are not properly covered with your Florida auto insurance. If you are found to be at fault, and the other driver suffers injury to their person or property, you can be held personally liable for the entire cost. On top of that, you could lose your driving privileges until the entire cost of the damages has been paid. For Boca Raton drivers, finding the right car insurance for you means staying up-to-date on State requirements. From legal regulations to common coverage levels for policyholders in Florida, we have the helpful information you need to get the protection you deserve. Florida is a no-fault insurance state. If you are injured in an accident, your car insurance will pay your medical costs up to your policy's limits, regardless of who caused the accident. One important note to remember, whenever your Florida auto insurance policy lapse, your insurance carrier is required by law to immediately notify the Department of Highway Safety and Motor Vehicles (DHSMV). The Florida DHSMV sends a notice of suspension by mail. You can calculate the cost of your auto insurance policy by going to our online insurance calculator for cars and trucks. There you can enter in details about you, your type of coverage and your vehicle to find out what the annual rate will be. We have access to multplie carriers to find you the best policy. Rates can range lower than you expect. We have written quality policies for as low as $500 per year. 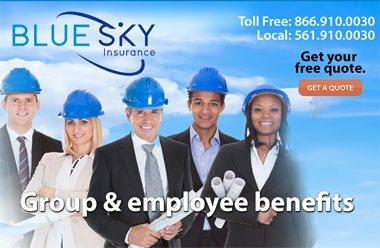 Let Blue Sky auto insurance agency in Boca Raton go to work for you by assessing your current coverage and Florida car insurance rates and discounts so we can get you a better policy and coverage and work on getting you the lower rates for your auto, truck, motorcycle and Florida RV insurance.